The Wu-Tang Clan’s Ghostface Killah and RZA and Shaun Redick of Impossible Dream Entertainment announced today they will join forces to produce the suspense horror thriller “Angel of Dust”, to be directed by filmmaker and Wu-Tang lead member RZA. Inspired by true stories that happened around the hood to members of the global iconic rap group when they were growing up in and around the Staten Island Projects, the bizarre and horrifying events shaped their mindsets to achieve their goals and launched the Wu-Tang Clan to become a worldwide powerhouse in music. Set modern day, Casey is a normal yet exceptionally smart teenager and talented rapper but after the mysterious death of his parents he’s been forced to grow up in NY’s roughest inner- city streets, also known as Shaolin in Wu-Tang folklore, basically on his own. As life in the hood around him gets tragically worse he must put his skills to the test to survive not only the gangs, corrupt cops, junkies and bullies, but a serial killer with seemingly supernatural powers dubbed by the media as the “Angel of Dust”. The story was created by Wu-Tang member, Ghostface Killah (aka Dennis Coles), and longtime friend and manager, Caruso, with screenplay written by Matt Leslie and Stephen J. Smith (STRAIGHT OUTTA COMPTON uncredited, Blood List favorite THE HARROWING, SUMMER OF ’84, which premiered at the 2018 Sundance Film Festival). The Wu-Tang Clan will provide an epic new soundtrack produced by Ghostface Killah and Caruso for “Angel of Dust”, RZA will also score the movie. “Angel of Dust” will be produced during the 25th anniversary year of their now iconic Enter the Wu-Tang 36 Chambers album. The famed group will be premiering at the Sundance Film Festival their new Showtime documentary series, Wu-Tang Clan: Of Mics and Men, which examines the cultural history of the hip-hop mega-group, on Monday, January 28th. The film will be produced by Shaun Redick (“BlacKkKlansman”, “Get Out”) and Yvette Yates of Impossible Dream Entertainment along with Wu-Tang’s Ghostface Killah and RZA, Gary Ousdahl of Foundation, and Caruso. iWood Studios who recently co- financed David Ayer’s new action thriller “The Tax Collector”, headed by producer financier Matt Antoun is set to finance “Angel of Dust”. Executive Producers are Mark Strome, Mickey Gooch Sr., Jamie Adler and Jonnie Forster of Foundation. Redick, hot off the success of back to back box office hits with Universal’s “Get Out”, and “BlacKkKlansman” with partners Focus Features, Blumhouse and Jordan Peele’s Monkeypaw, currently has “BlacKkKlansman” back in theaters nationwide. The phenomenally produced movies have garnered a total of 10 Oscar nominations over the past two years, dozens of accolades and AFI Top Ten Movie Awards for 2017 & 2018. The Black Klansman best-seller book and true story of Ron Stallworth was brought to Redick and Yates of Impossible Dream Ent first by the writers, Charlie Wachtel and David Rabinowitz who then worked together along with Spike Lee and Kevin Wilmott to develop the screenplay which just received a Best Adapted Screenplay Academy Award nomination for 2018. Joining them is groundbreaking filmmaker RZA, who has made an indelible mark on movies since his debut feature, THE MAN WITH THE IRON FISTS. 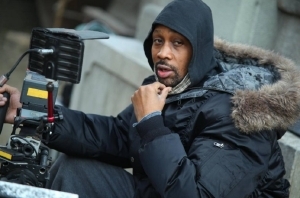 RZA directed and is currently in post-production on the new action thriller CUT THROAT CITY starring Ethan Hawke, Terrence Howard, Eiza Gonzalez and Wesley Snipes. He’s worked as an actor and writer on multiple films, and composer on movies including Sundance film ROXANNE ROXANNE. Said Ghostface, “It’s a blessing to partner with Oscar nominated producer, Shaun Redick and Impossible Dream Entertainment, and to be doing business with my brother, RZA directing is a dream come true. Putting all these great minds to work together will be legendary”. RZA is repped by Mike Simpson of WME. The deal for RZA was negotiated by WME and Joe M. Carlone of King, Holmes, Paterno & Soriano. Leslie and Smith are repped by Adam Perry at APA and Jeff Portnoy at Bellevue, and their deal was negotiated by Marios Rush of Marks Law Group. Ousdahl, Caruso and Ghostface Killah were represented in the deal by Matthew Jacobs of Gray Krauss Sandler Des Rochers LLP. Bob Abramoff of Burgee Abramoff and producer Shaun Redick negotiated the deals for all including RZA & Ghostface, the Wu-Tang Clan, writers- Leslie and Smith and financiers.